07 July 2016 – A new specification 0360001120 Top Drive Saver Subs is now published and available from the NSInfohub. – the online version of NS-1(TM) means that it can react to the needs of modern drilling quicker and with more focus. A new specification for Top Drive Saver Subs (TDSS) is now available from NSInfohub. NS 03.60.00.1120 TDSS is now part of the NS-1™ Standard, specifying the minimum quality and inspection requirements applied to wrought low alloy steel TDSS for non-sour service conditions. At present TDSS are not specifically covered in any other industry standard. Top Drive Saver Subs, as the name implies, are used to save the drillstring and the top drive from expensive frequent maintenance costs by acting as the expendable element between the two components. Because TDSS are relatively easier to repair or replace, they are therefore cheaper to maintain. This new NS-1™ specification includes supplementary requirements for threaded connections, mechanical properties, marking and inspection. 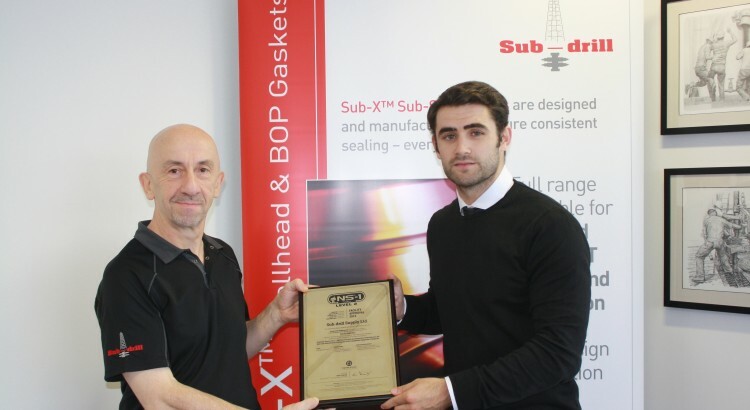 Our Sales and Marketing Support Kevin Fearnley Jnr awards Mark Paton and David Mackie from Sub-drill with a Fearnley Procter NS Level 2 Facility Approval for Manufacturing of Drill Stem Substitutes. Doing more & helping you to save money – both suppliers & operators. If you have not heard already – Spec Q1 (API) and Spec Q2 (API) have been added to our Quality Management Service assessment – plus shortly ISO 9001:2015. A good step forward in our continued obsession with minimising avoidable drilling equipment failures. We also provide training courses on their requirements. We have also completed Technical Gap Analyses between NS-2™ and API RP 7G-2 and DS-1® – available via our website so you can see why we specialise in Critical and Complex wells. These information programmes have relevance to all disciplines within the drilling operation. Along with the other services within Fearnley Procter International we want to provide support that will bring global benefits to any drilling programmes from initiation to completion. You can learn more about how from our corporate website. *DS-1® is a registered trademark of TH Hill Associates, Inc.